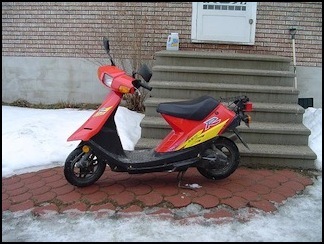 I have ridden this Suzuki scooter for 10 years, Have got 35000 km on it, Replaced only tires and a vacuum pack,and spark plug. Love the narrow seat, love the fact I can sit on it on its stand and touch the ground with my feet, Still use it. Hi, I'm looking for the user manual or service manual for the AE50 Anyone have a copy they can share? Despite its gruff exterior the scooter has recommended itself as the insatiable means of power and velocity! I/m pleased with it very much!